If you are like me you are always trying to squeeze one more thing into your day, so when dinner rolls around if it hasn’t been planned out it can become a stressful time very quickly. Here is a great dinner recipe that can be pulled together in under 30 minutes and under 6 bucks for 2 adults, plus left overs. I know you are thinking that can’t be right, well I am hear to tell you it can happen! Shred your chicken once done (this is where you will have about 1/2 cup of shredded chicken for another meal). Get your prepped lettuce from earlier in the week place it in a circle around your plate, place about 3/4 C quinoa in the middle of the lettuce. 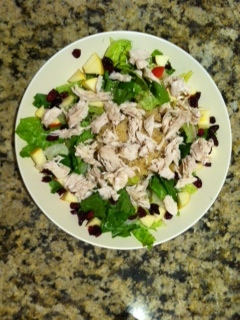 Add 1/3 of the shredded chicken on the quinoa, place apples and dried cranberries on the outside. Drizzle with you favorite dressing, for this recipe I especially like the Briannas BlushWine Vinaigrette. Trust me with the added quinoa this salad will not only satisfy you it will fill you up. It is packed with lean protein between the quinoa and boneless/skinless chicken breasts. Packed full of vitamin C (romaine lettuce and apples), B6 Vitamin, Omega 3’s and antioxidants from the dried cranberries. Check back next week to see what I do with the leftover shredded chicken and quinoa. For now I hope you enjoy this quick, nutritious and especially affordable mid-week dinner option. Enjoy! This entry was posted in Be Healthy, Favorite Recipes and tagged Anioxidants, chicken, Dinner Under $6, Omega 3's, Quick Mid Week Dinner, Quinoa. Bookmark the permalink.